I’m a big Oppel fan, and the pairing of Jon Klassen’s illustrations only intensified my need to read this book, so when it came out I popped into my local bookstore (Kaleidoscope Kids Books in Ottawa!) and picked it up. I honestly didn’t know what to expect from this book, and I think that’s the correct mind set to have when reading a piece of fiction–and I mean straight-up fiction, not an adventure or romance or dragonriding fantasy, just straight up fiction without pretense. Why? Because so often this kind of fiction (even if it does dabble in various genres) is simply real life with a twist and there are so many ways that “real life” can be realized that the possibilities are endless. Hence (the collective) “our” obsession with fiction. 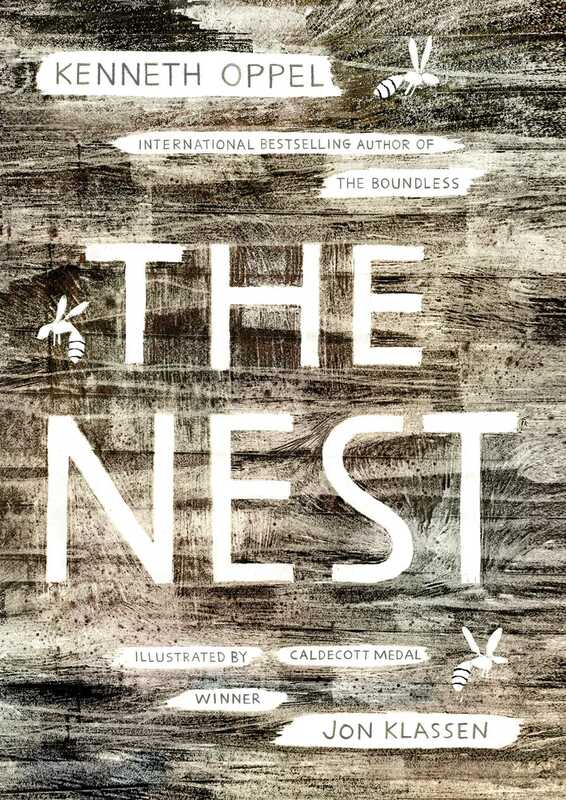 The Nest, which is more of a novella than a novel, follows our protagonist Steven, an anxiety ridden young boy (between 10 and 13? ), who sleeps with his blankets bunched up around his face, washes his hands until they chap, and composes lists in his head and to physically read over in order to calm himself. Steve is a wonderful character and instantly believable and sympathetic in his mild, thoughtful and gentle mind. As the hot unbearable summer is trumped by any family’s worst nightmare–an ailing baby– life begins to intensify for Steven. The baby (for about half of the book Steve simply refers to Theo as “the baby” as a coping/distancing mechanism) suffers from some sort of congenital disorder and requires heart surgery, of course, before he can have surgery he needs to be as strong as he can be. The story of the family, Steven, the wasps and a mysterious Mr. Nobody unfolds over the summer between his parents’ trips to the hospital, through conversations with their babysitter–a university student who studies zoology–and through Steve’s own dreamscape. The writing and the pacing here are magnificent as we readers are left wondering if the wasps and the mysterious Mr. Nobody are actually real or if they are figments of Steven’s imagination: a sort of strange escape for Steven and a way to explain and cope with Theo’s unfortunate circumstance. The pacing of the story was The Nest‘s true success as we (and even Steven!) are constantly unsure about the intentions of the wasps or Mr. Nobody . . . good and bad have no place in this novel and that’s probably because life just isn’t that simple. Yet everything is unsettling and creepy. The Queen wasp genuinely soothes Steven and seems to really want to help, at the same time she is talking about replacing Theo which just seems wrong. Then we have the creepy Mr. Nobody who calls the house and doesn’t speak, who calls Steve’s little sister on her toy telephone *shivers* and who is embodied by an eight fingered knife sharpener who drives around their neighbourhood (and doesn’t have any customers) over and over again ringing his little bell . . . As the pacing picks up, the heat of the summer intensifies, the wasps’ replacing of the baby draws near and the whole family eagerly awaits Theo’s surgery the threads of the story begin to pull together–oh, and don’t even think that you can put the book down the feed your own baby! This kind of insight is littered throughout The Nest and for me makes the story, marketed as a comparison to Coraline, more akin to Patrick Ness’ A Monster Calls or More Than This or perhaps, if we have to have a Gaiman comparison The Ocean at the End of the Lane because, in a way, it was a slice of life book with an uncanny bend to it (sci-fi or faery I really don’t know, and it doesn’t necessarily matter and I think this is true of the comparison books I suggest here). Oh, and I have to mention the beautiful charcoal illustrations by Jon Klassen. They are not only stunning, but more often then not features shades of grey adding to the atmosphere of the text in a thematic and poignant way. This is a great read, appropriately marketed to Middle Grade just also suitable for older readers. It is creepy, but that’s the point and don’t worry, your middle grade reader can take it! Teachers and librarians alike will enjoy this book in their classroom as a way of talking about “normal” and coping, illness, themes and motifs in literature and hey, even the subject of insects might draw in your reluctant readers (don’t forget to mention that it’s written by their favourite Canadian author who wrote about the bats!). I hope you enjoy–and I hope to read your opinions of the book in the comments!